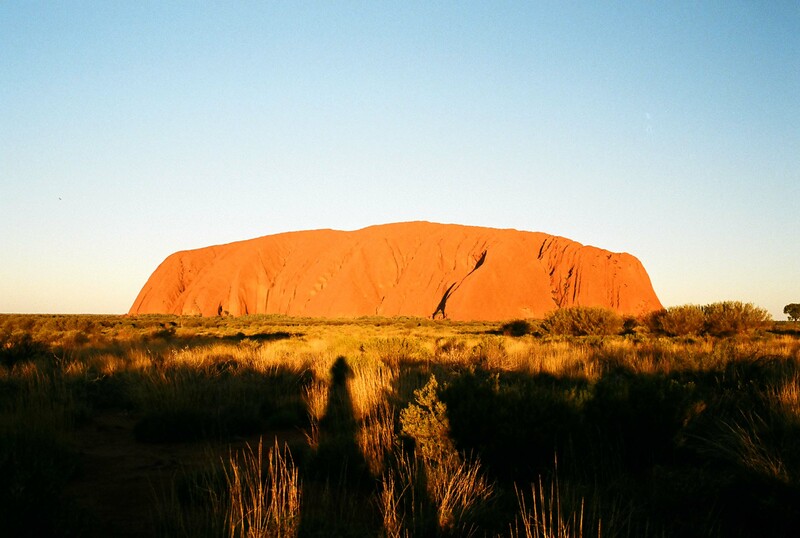 I had for a long time wanted to see Ayer's rock, the massive monolith known to Australia’s aboriginal people as Uluru. Looking back at my trip, I think seeing Uluru is perhaps the reason why I had intended to go to Australia in the first place. Sounds a little funny flying half way across the world to see a big rock……..
Nestled in the desert sands of the Australian outback, Uluru is a sacred place for the Aboriginal people. The colossal monolith is 10 km in circumference and rises 800 meters from the ground. Every angle of Uluru has a different look with its steep cliffs and rocky outcroppings. Various watering holes and small caves with ancient aboriginal painting are embedded at the base of the rock. 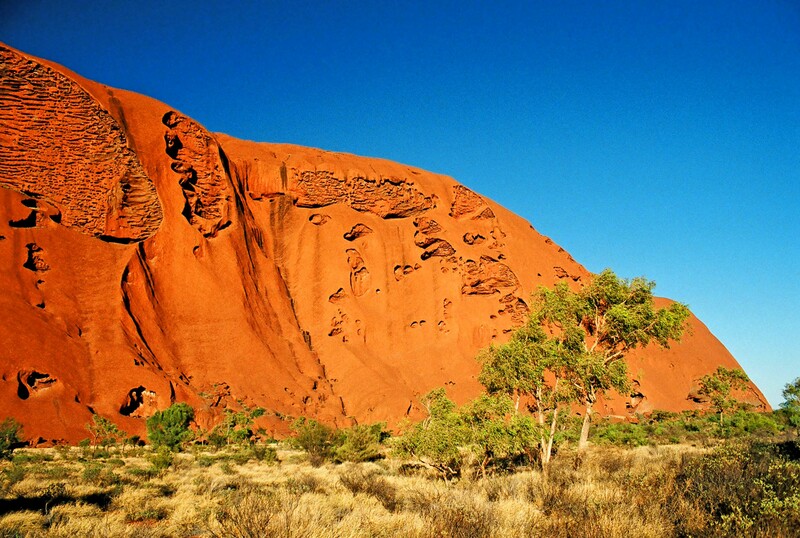 Uluru is legendary for its protean color changes at sunrise and sunset. I could have watched the sun set a thousand times over the rock and I think I would have still been impressed. As the sun slowly descends, the sky and wispy clouds above look like a dreamy water color painting, a celestial rainbow of yellows, pinks, and faint blue splashed across the heavens. During the day the barren rock glows a bright orange. As the sunset approaches Uluru’s colors morph into warm hues of red, crimson, purple, deep brown and finally the ethereal rock fades into a black shadow on the horizon under the moonlight sky. The park discourages climbing the rock and signs posted outside the rock officially forbid climbing, but in reality a lot of people who come to Uluru make their way to the top. The first part of the climb is a long steep 45 degree finger of the slippery rock with steep descents on either side. There were a series of metal poles bolted into the rock linked by a chain in the first steepest part of the climb. It’s hard to imagine the ancient Aboriginals ritually climbing barefoot without the aide of the chain. After about 45 minutes of climbing the steep incline gives way to a flatter portion with gullies of water collected in crevasses as the path ascends to the top. Finally at the top the sun shines bright and the wind blows fiercely. The view from above was exhilarating and in the distance there is another random rock formation called Katja Tiuju in the otherwise endless expanse of flat outback. There is a small eco-village called Yulara about an hour from Uluru where tourists stay. Years ago you could camp at the rock but camping was eventually banned due to environmental damage and pollution by campers. About an hour from Yulara is Katja Tiuju, the other series of huge rock formations in the barren outback landscape. I spent a day hiking the trails and hills around this equally impressive geological anomaly. 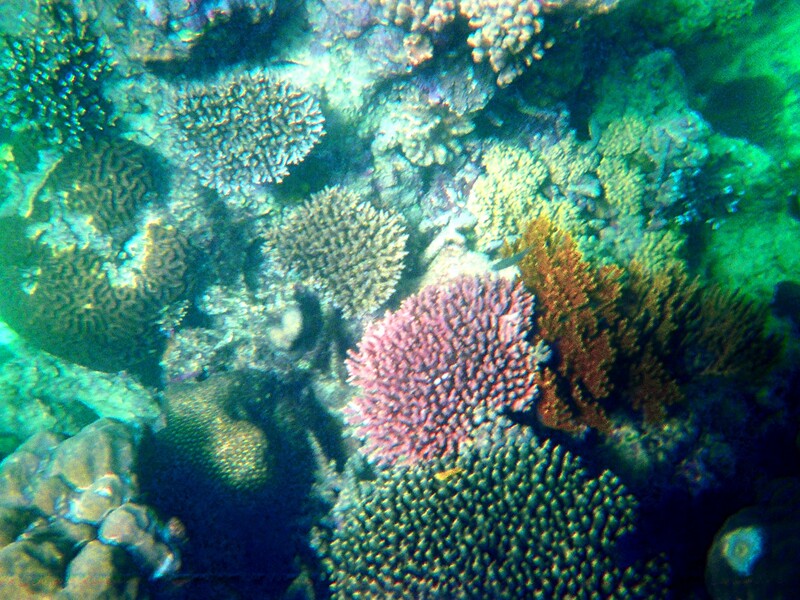 The Great Barrier Reef is the world's largest reef, stretching 2600 km along the coast of Queensland. I had flown to the city of Cairns, which is an interesting enough city if a little touristy. The city has quite a few bars and even more souvenir stores packed with all things kitsch. Cairns is a peculiar place with lots of Japans tourists, so many in fact that a lot of signs are actually also in Japanese. The beaches weren’t so interesting and swimming wasn’t really allowed as the waters immediately off Cairns beaches are teaming with jellyfish, the occasional crocodile, and water snakes. The city is used mainly as a base when taking boats out to the reefs, which lie an hour away by boat. I had initially only intended to go snorkeling in the barrier reef since I had never taken a scuba diving course or ever been scuba diving for that matter. My time was limited so I couldn’t take a 3-4 day certification course for scuba diving. I booked passage on a huge hydrofoil boat that held perhaps 100 other snorkelers and divers. At first it was raining and the ride was choppy. A few of the divers were seasick, it was oddly humorous to see the guides usher the seasick passengers outside for fresh air as it seemed to make the those passengers even more seasick as they puked into the wind. Once we were close to the specific reef we visited one of the dive leaders told me I could take a 10 minute crash course in scuba diving and scuba dive instead of snorkeling for an extra $20. I though about it and of course I had to sign up. Perhaps not the ideal way to learn to scuba dive but then when would I ever be in the Great Barrier Reef again. The whole trip felt like a quirky assembly line and the dive leader gave a little mini-lecture for about 10 minutes about how to use the regulator and what to do if your goggles came off underwater. In reality it all seemed pretty straightforward. With that I put on a wetsuit, the guides tied weights on my belt, set me up with an oxygen tank on my back, fitted my regulator and finally I dived right into the reef. I could hardly believe I was off into the water to go scuba diving but the experience was amazing. It was definitely a little surreal and very disorienting at first but there was a guide swimming with me and the three other divers in my group and we only went 15 feet under to the reef on the floor. We didn’t go down all that far so no risk of the bends or anything like that, but it was mildly disorienting at first as I found it difficult to determine if I was swimming horizontally or tilted up or down. The vast schools of bright fish and rainbows of coral were astounding. There were long eels, giant blue and green wrasp fish, and other exotically colorful fish darting in and out of the expansive corral. When I got back to America I called a friend of mine who for years always talked on and on about how amazing scuba diving was, I told him simply “now I understand”. My little smattering of scuba diving was more exciting than I had imagined and I hope to do more diving in the future. Most Australians I have met in the course of my travels have always spoken very highly of Sydney and so when I finally visited the city I understood why it is such a pleasant place. Cosmopolitan Sydney is a bustling and lively city with its beautiful harbors, amazing nearby islands, beach walks, expansive parks, and great nightlife. 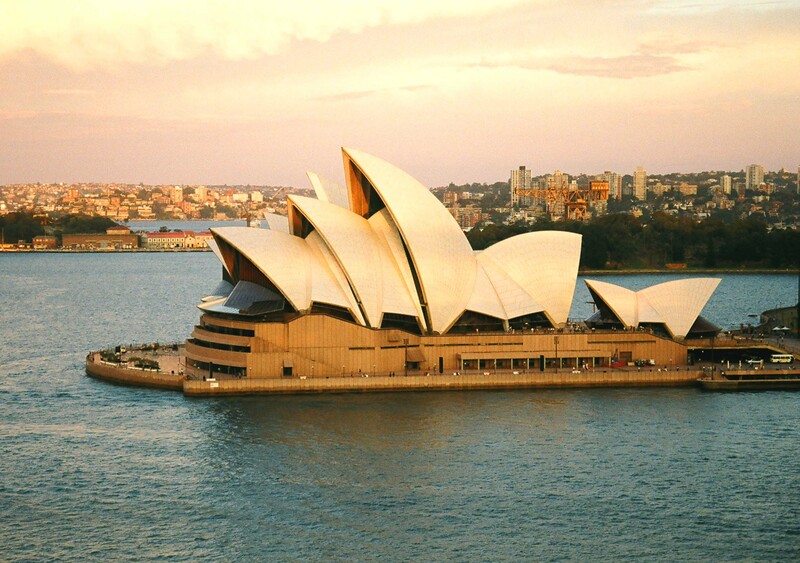 Sydney’s most iconic landmark is of course the Sydney Opera House. The series of structures look like giant seashells and the tiles covering the structures sparkle against the azure sky. The whole complex sits on the harbor surrounded by trendy bars and outdoor cafes filled with people. Nearby, a walk across the imposing harbor bridge offers amazing views. There is no shortage of things to do in Sydney. The beaches of Bondi and Coogee were not far away. Bondi gleams a deep blue as surfers ride large waves and beachgoers play volleyball and take in the sun. The water is cool and refreshing. From Bondi it’s a very pleasant two hour walk along a series of cliffs hugging the coast to another Beach called Coogee Beach. All along the cliffs are lesser beaches and smaller swimming holes. 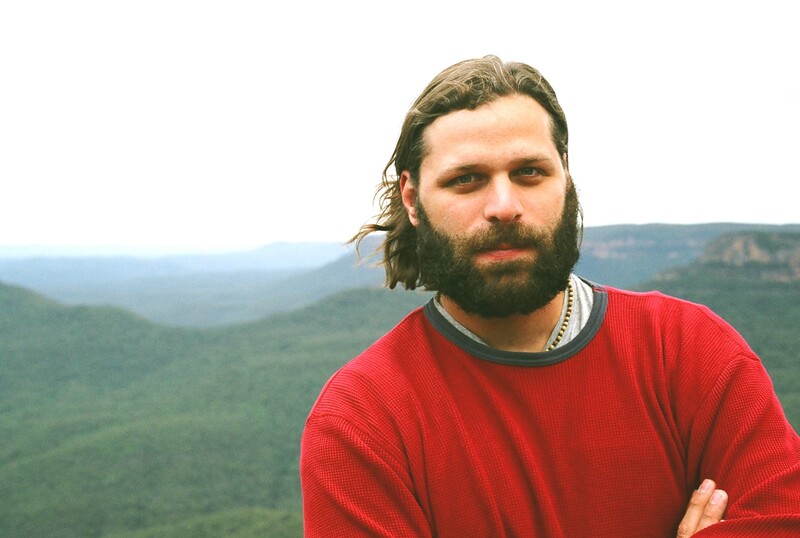 Katoomba is a couple hours by train from Sydney and is a good starting point for “bushwalks” in the Blue Mountains. The walk I took was through a series of dramatic cliffs, waterfalls, gorges, and canyons overlooking a vast forest of eucalyptuses trees and gum trees below. The Blue Mountains get their name from the bluish haze caused by the volatile oils from eucalyptus trees that evaporate into the air. Melbourne is a laid back place, perhaps not as quite exciting as Sydney but a nice place to hang out. There happened to be a very entertaining comedy festival in Melbourne's Federation Square while I was there and some of the performers were hilarious. It rained a lot but I still enjoyed ducking in and out of the markets and bustling avenues for a look around. I found my way to the beaches of St. Kilda but it was too cold and windy for a swim. The sunset was nice against a harbor filled with sailboats and small docks.